Fisher Price was probably one of the biggest companies to make kids toys. They came up with the coolest items for every age group. I was the proud owner of the Little Tykes Basket Ball set. It rocked! The best part was every time you scored a basket, a bell would ring! And you could keep score by rotating the number wheel on the right and left sides of the basket! I also had the Little Red School House. It was even more of a novelty for me as we had a Little Red Schoolhouse in the town where I grew up! This was not just a school house playset - it was a chalkboard and a magnet board as well! In fact, my mother still finds those letters around the house, some 30 odd years later! The garage playset was awesome. That ramp was the coolest! But nothing beat out the barn! When the doors opened up, you heard the loudest "MOO" ever heard. And of course, we all remember the Little People! How many people had the dog only to have it end up with one ear which would be twisted upside down?! Super 8 Theater presents Santa Claus' Story performed by Monkeys!!!! This item was a very special and bizarre part of my childhood. I went through a phase where I wanted nothing more than to have a brother. Unfortunately, I had one sister and after me, my mom was not able to have any more children. Then I heard about this television show called SOAP where a character on the show had a dummy that he referred to as a brother. Being the impressionable child that I was, I asked for this dummy that was advertised in the Sears Catalogue. It was called Willie Talk. A play on words that never hit me until I was well past this stage of my life and kept the dummy in a box in a closet. Anyway, I received him for Christmas and took him with me everywhere, always referring to him as my brother Willie. This worked rather well until I dropped him and his mouth caved into his head. I was able to pull out the mouth and put it back in place, but since the fall had broken one of the points that kept his mouth in place, if I pulled the cord on the back too hard, the mouth would go back into the head again. Eventually, as I stated above, Willie Talk found his way into a box in my closet where he stayed until years later when I tossed him. For some odd reason, my family liked to give me lots of Dallas Cowboys related items. I don't know why. I was never a fan of football. I didn't play football. 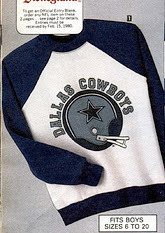 I only liked the Cowboys because in the 70s, you were either a Cowboys fan or a Steelers fan. I chose the Cowboys because of their colors (I picked the Dodgers as my fav baseball team for the same reason!). 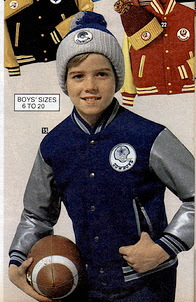 Anyway, with my parents trying desperately for me to be like other "normal boys" I guess they thought that NFL paraphenalia would help make a man out of me. Hence the pajamas, sweatshirts, duffle bags, bedspreads, etc . . . Interesting side note to this story: My mother was extremely over-protective of me as a child. Even if I did want to play football she would not have allowed it. In fact, she even found a way to not let me play flag football in gym class. Which makes these gifts even more confusing. 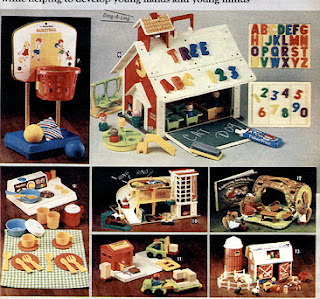 Continuing with my 25 posts of Christmas, I bring you some items from the Sears Wishbook. As I stated last year, when I was young, gearing up for Christmas meant breaking out the latest Sears Wishbook and writing out a 3+ page list of all of the goodies inside that I wanted for Christmas. I then gave it to my Mom who of course sent it to Santa who we all knew used the Sears Wishbook for all of his shopping! As I did last year, I thought that I would share some of those great items that made the list and eventually made it under the tree. 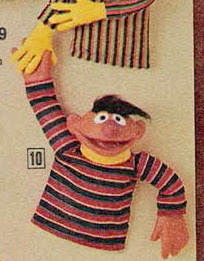 For this post I bring you the "controversial" Ernie puppet. This was a hand puppet that was given to me one Christmas when I was very young. Since I came from a big Italian family, we would exchange gifts between the family on Christmas Eve (after the 5 hour dinner spectacular!). On that fateful Christmas Eve, I received the Ernie puppet from my Aunt and Uncle. At first I thought it was great. Then my father picked it up and tried to entertain me by biting me on the nose with it. Of course, this terrified me and started me crying which then led to the puppet being locked away in a drawer, never to be played with again. Good times!